Laneíge means 'the snow' in French. I'm sure most of us are familiar with the brand because it's fronted by the very gorgeous Song Hye-kyo (송혜교)! 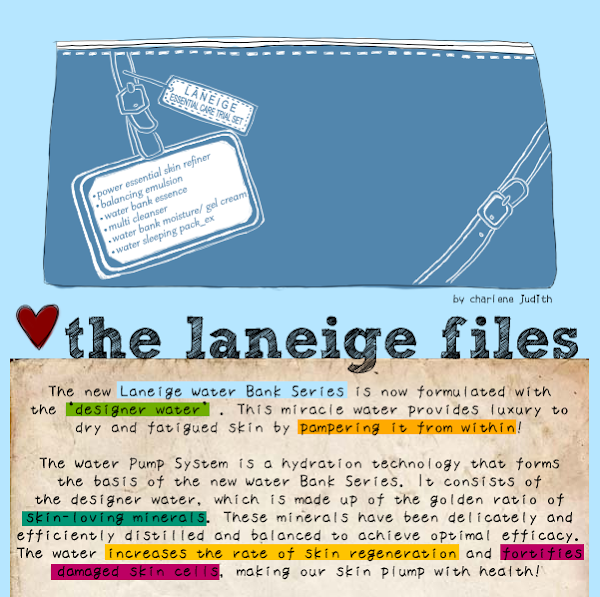 Water is the secret to beautifully hydrated skin and this makes up the basis of Laneíge's concept. 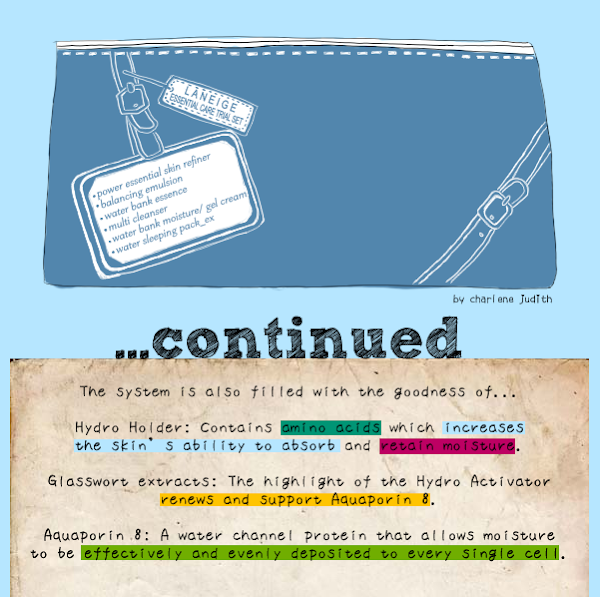 The Water Bank Series is created from the 'designer water', a product of the Water Pump System (Read above for more information!). Together with the Hydro Holder and Hydro Activator, the products 'infuse moisture deep into skin layers seamlessly and increase moisture circulations within skin cells'! This means non-stop hydration for 24 whole hours (That's 12 hours more than before!)! 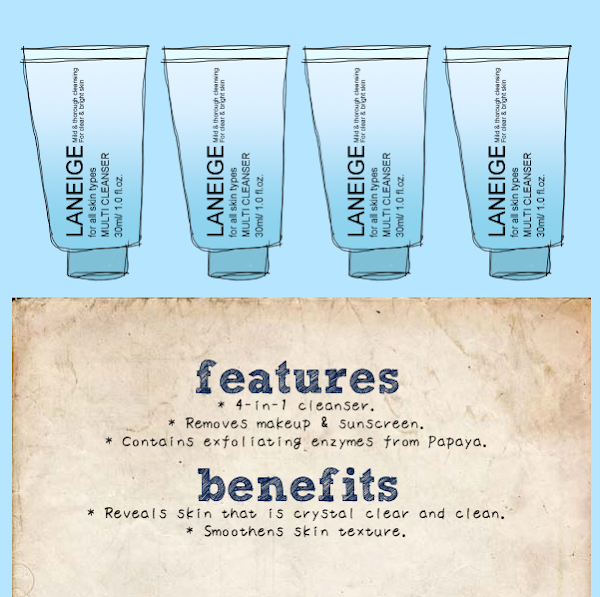 The Laneíge Multi Cleanser is a 4-in-1 cleanser for all skin types. It removes makeup and sunscreen, cleanses and exfoliates, all at one go! The dense foam, which is a concoction of mild plant-based ingredients and Papain enzymes (Extracted from papaya. ), removes makeup completely, purifies pores and gently exfoliates to reveal smoother skin! The cleanser comes in a 30ml squeeze tube, so you needn't come into direct contact with the product. Thumbs up for hygiene (I know, I'm very particular!)! A pea-sized amount is all that I need for my entire face. After wetting my face a little, I massage this onto my face in outward circular motions. 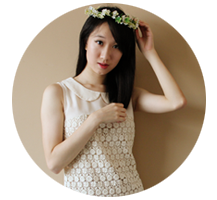 As usual, the most important thing that I look out for in cleansers is the after-feeling. This cleanser doesn't leave my skin feeling too tight and too clean, so thumbs up again! :D With this cleanser, I can combine two steps, cleansing and exfoliation, in one and this is perfect for the busy ladies! L'Oreal Paris Glam Shine 6H in V5 Iredsistible. A pea-sized amount of the cleanser, some water and away we go! The cleanser removes most of the makeup, but you can still see some traces of it, especially from the K-Palette eyeliner. From my experience, most cleansers that purport to remove makeup don't exactly do a very clean job. So I always use a makeup remover first. Sunplay's SPF130 PA+++ Super Block (Clear Finish). 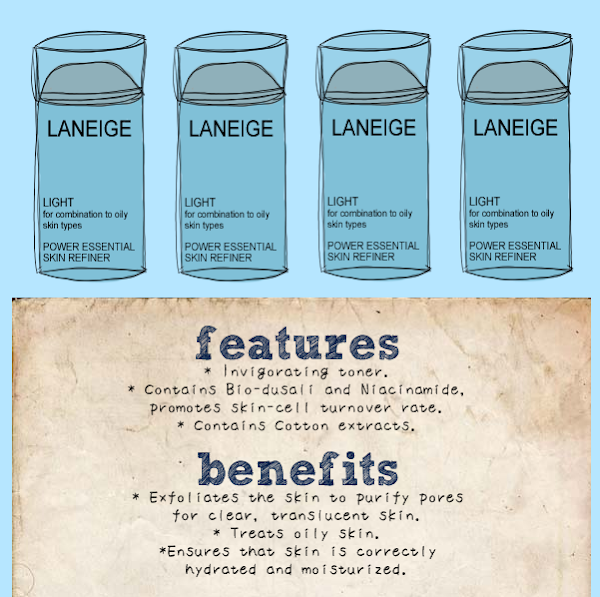 The Laneíge Power Essential Skin Refiner_Light is for combination to oily skin types. It refreshes, purifies and softens the skin. Eliminating impurities from the pores and removing keratin, it reveals skin that's crystal clear and healthy! Bio Dusali, which is extracted from fermented seaweed, promotes keratin turnover and Hyacinth extracts purifies the skin from pollution and harmful weather elements. Niacinamide brightens up skin tone and Cotton extracts prevents skin damage. The toner comes in a 50ml bottle and has a light, pleasant fragrance too. After cleansing, I pour some of this onto a cotton pad and swipe it on my face in the outwards direction. 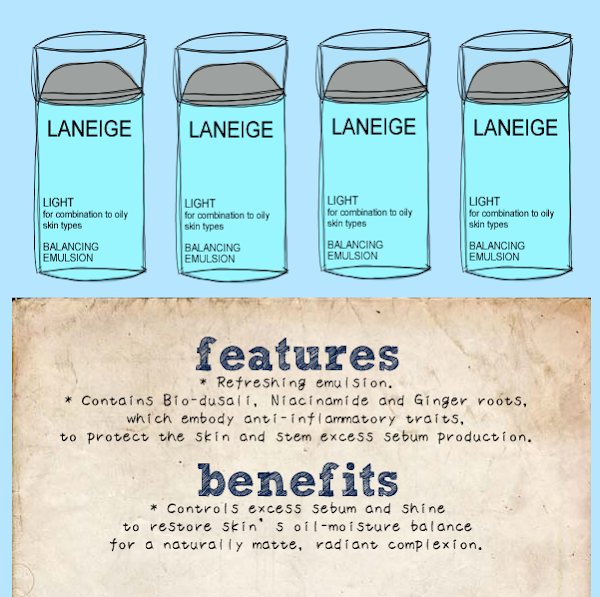 The Laneíge Balancing Emulsion_Light is for combination to oily skin types. It purifies and hydrates the skin to ensure that it's fresh and clear. It helps strike a balance between oil and moisture in the skin. The emulsion comes in 50ml bottle and has a pleasant, clean scent. Again, hygiene is taken care of because the emulsion is poured out from the bottle. :D I use this after the toner, pouring a small amount of it on a new cotton pad and swiping it on my face in the outwards direction again. GOODIES: Christmas Love from Japalang! RAMBLINGS: What it means to be a Virgo. RAMBLINGS: The L word. Again.